The Baku Olympic Stadium has been named a venue for the 2019 UEFA Europe League final. The decision was made at a UEFA Executive Committee meeting in Nyon on September 20. 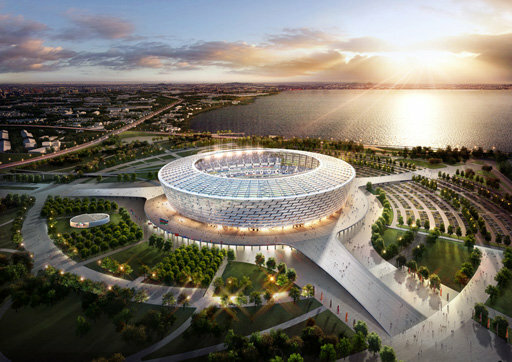 To be held on May 29, 2019, the final will be the first such decider played in the Azerbaijani capital, according to UEFA. The 69,870-seats Olympic Stadium was ready in March 2015, and in June 2015 it served as the main venue for the 2015 European Games, hosting the opening and closing ceremonies and the athletic games. In May 2017 the Stadium hosted the opening and closing ceremonies of the 4th Islamic Solidarity Games, as well as the athletics games of the event. The stadium will also host three group games and a quarter-final of UEFA EURO 2020. The facility consists of the main and auxiliary stadiums, an auxiliary building, as well as sections for VIP, CIP, media and disabled spectators. In August 2015, the Engineering News Record magazine declared the Baku Olympic Stadium the best sports facility of the year. The Baku Olympic Stadium was also recognized as "The best new stadium in the world" by the World Congress of Stadiums-2017 at its gathering in the capital of Qatar, Doha. As for the 2019 UEFA Champions League final, it was entrusted to the home ground of Atletico Madrid FC - Wanda Metropolitano stadium, and the UEFA Super Cup will take place in Istanbul at Vodafone Park stadium. Baku had put forward its candidacy to host the finals of either the Champions League or Europa League in 2019.